My last prompt was August 3. Today is August 19. I’ve been struggling this summer with an old friend, the demon depression, and just not feeling like writing (or doing much of anything). When you’re feeling low, getting out of bed is often the only goal in a day (fortunately, I’m not doing that poorly this time) and for me there have been days when just getting to work is an achievement. So be it. Additionally, with all the news in the world being so difficult these days, I know many sensitive people, many of them poets (like any other kind of artist) who’ve been feeling the pain a little more in the heart than at other, less news-anguish-y times. I’ll be posting (to my other blog A Twirly Life) a collection of links I’ve appreciated in the past month, in case you’re interested in how some other people are weathering. This poetry prompt is about trees! Today, my commute coincided with The Writer’s Almanac and the poem was “The Country of Trees” by Mary Oliver. Unfortunately, the text of the poem is not available, probably because her book Blue Horses is not even published yet! But it was such a beautiful poem, and it contains a section in which she’s talking about the trees and listing the things into which they have been made: houses, fences, bridges. I thought, “Ah ha! That’s a great idea for a poem prompt” — write about all the things that might have started out life as a tree. What do trees mean to you? Just look around you — on my desk right now I can see a pencil, a book, the desk itself, the poster on my wall, the photo of a tree in a wooden frame. Then there are the wooden soles of my shoes and the wooden buttons on my jacket. I am surrounded by the spirit of trees. Because I will not leave you without a poem to read, I offer you a couple of other poems about trees, one “rather slight” and one serious. 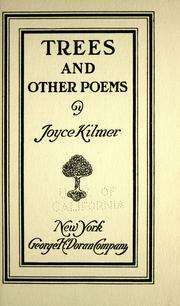 “Trees” by Joyce Kilmer is perhaps the most famous tree poem ever. The opening couplet, “I think that I shall never see / A poem as lovely as a tree,” has been much lampooned, but it’s actually a great poem. Read all about it here. There’s even a very cute picture of Mr. Kilmer as a college kid — did anyone else always assume Joyce was a woman? Bad on me! “Tree” by Jane Hirshfield is one of the poems I have closest to my heart. You can read it here, and hear her reading it too. I love the small details, the sounds (oh! the branch tips brushing!) and the questions it poses so gently: who will last, what is important to you, what are you going to choose? This poem has special meaning for those of us in California. Cupertino has many redwood trees, and they’re not getting any smaller!